Summary for the Busy Executive: The other Günter Wand. I suppose when you ask most music-lovers about Günter Wand, they think of the Brucknerian. Because of my musical interests, that idea struck me as more than a little strange. While I like Bruckner's music, I don't thrill to it, like his ardent fans, or even seek it out very often. A little Bruckner seems to go a long way with me. However, I do love the Twentieth Century, and Wand had built his Cologne and Hamburg bands into European powerhouses of Modern rep, along with Rosbaud's and Gielen's Southwest German Radio Symphony. Nevertheless, none of these men specialized in the Modern and Contemporary. They all could do other things superbly: Rosbaud, a great Mozart conductor, Gielen magisterial in Beethoven and Mahler. However, Wand in particular felt a mission. He took over the Cologne Radio Symphony just after the war. Creative German musical life had crumbled. The Third Reich had either killed or exiled most of their first-rank composers. Schoenberg, Hindemith, Toch, Korngold, and Weill, had left for the United States and didn't intend to come back. Schulhoff, Haas, Kremer, and Ullmann perished in concentration camps. Generations of young composers had been both denied the teaching of these men and cut off from a Modernist mainstream. Arguably, Germany has yet to recover. But for the brief emergence of the "Darmstadt School," the new-music action still seems to have happened largely elsewhere. Wand saw it as his duty to encourage the young guard, as far as he was able. He also didn't want to perform works he didn't believe in. In general, he chose somewhat conservatively – Zimmermann rather than Stockhausen, for example – and he did turn down works that fortunately went on to have a life outside his orbit. Yet, he indeed took chances and for the best of reasons. This CD consists of broadcast recordings. Here and there, one finds minor fluffs, but these don't detract from, in general, stunning accounts. The Stravinsky and Ligeti are classics and the Zimmermann and Fortner certainly not less than interesting. In fact, despite some stumbles on the orchestral "stings" in the second movement, I don't hesitate to award Wand's performance of the Stravinsky piano concerto pride of place. Indeed, he and soloist Nikita Magaloff have changed my notions of this work, which usually comes across as a trifle stodgy (or "monumental," if you like it). That's certainly the case of the composer's Sony recording with Entremont, all in all a misfire. The later Capriccio, written for Stravinsky's own piano capabilities and concert use (he claimed to lack sufficient left-hand technique for the concerto), engages a listener far more. However, under the leadership of Wand and Magaloff, Stravinsky's stiff monument becomes electric, a wild thrill ride in the first and last movements, beautifully lyrical in the slow movement. You can hear links to the slow movements of Ravel's G-major concerto and Poulenc's concerto, the latter at least a quarter-century down the road. One doesn't often imagine Stravinsky's music as tender, though he does indeed have his tender moments. 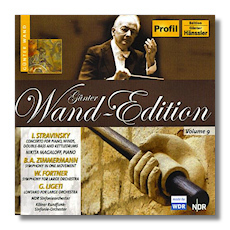 Bernd Alois Zimmermann's symphony shows close affinities with the Brucknerian symphony, although it runs far shorter. One hears in it a concern to connect with the German symphonic tradition as well as to innovate. Zimmermann's high sense of mission ultimately hurt him. Music was "more than music." It had to change not only individuals, but whole societies. Zimmermann, born in 1918, took his own life in 1970, after his best work, the opera Die Soldaten, failed to transform the moral face of Western Culture. Like most one-movement symphonies, Zimmermann's breaks down into sections: an intro, a march, a funeral march, a scherzo, and a quick conclusion, with slow interludes cropping up along the way. The whole thing sounds almost dodecaphonically tight, but I can't tell without a score. It's mainly a cry, a lament that wants to get inside you. Keeping it all together couldn't have been easy, but Wand and his band give you something deep and Romantic. Fortner's symphony, on the other hand, counts as my first acquaintance with this composer's work. Fortner taught both Zimmermann and Henze, and Henze may have learned his clear scoring from Fortner. Fortner's work surprised me, due to its resemblances to the propulsive American neoclassicism of the Forties. I suppose that Stravinsky's Symphony in C and Symphony in Three Movements provide the link. It's a very attractive work, full of vigor and drive, but not iconic. Younger composers, including Henze and Zimmermann, chose different paths. One of those different paths was cut by Ligeti, and you've got to give Wand credit for his championing of this composer. Wand also programmed Atmosphères (1961). Both that and Lontano update musical Impressionism and spawned a raft of knock-offs, most of which have sunk without regret. The different comes down to the fact that, unlike his imitators, Ligeti was an inspired composer. Lontano is a study in melting and shifting colors as well as dynamics. There's no melody, harmony, or even much in the way of distinguishable rhythm. Yet the piece fascinates as a kind of tour de force. Superficially, it reminds most listeners of a wash of sound, like the similar vocal effects in Lux aeterna, used in Kubrick's 2001. In both cases, however, "wash" really is the wrong word. Close listening reveals a canny exploitation of ambiguities of timbre among instruments – one can mistake an oboe in a certain register for a trumpet, for example. The method has its roots in Webern, particularly in that composer's orchestration of the Musical Offering's Ricercar, but Ligeti changes the emphasis. In Webern, the orchestration illuminates structure. In Ligeti, the orchestration pretty much is the structure. Every event, precisely notated (no aleatoric "vamp 'til ready"), sparked interest among composers in how Ligeti pulled it off. This led not only to new techniques, but to new cliches of contemporary music, from which Ligeti himself remained blessedly free. If ever a composer might be called visionary, it's Ligeti. And his vision of how music could move and sound changed significantly and more than once over the years. An extreme attentiveness and rhythmic crackle distinguish all the performances on the CD. Wand insisted on something like eight rehearsals for every performance, so nothing sounds slapdash or hurriedly considered. The amount of detail impresses as well as the amount of forethought with each score. The music sounds as if it has become part of these players, a spontaneous expression that paradoxically comes only after a great amount of work. The sound is good, but not luxurious. That wouldn't suit these works anyway.